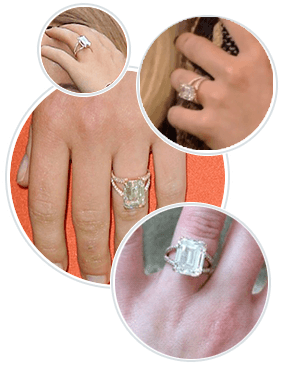 Hayden Panettiere’s engagement ring – A Big Bling! Hayden Panettiere’s engagement ring from boxer Wladimir Klitschko is massive! Worth an estimated half-million, the knockout engagement ring features an emerald cut diamond that weighs in at about six carats. The happy couple dated for two years beginning in 2009, broke up in 2011, and rekindled their romance in 2013. Like Hayden Panettiere’s engagement ring, this beautiful example from Brilliance features a magnificent emerald-cut diamond. A total of 58 round cut diamonds are pave set in the halo and along the ring’s split shank, adding even more glamorous sparkle to the overall presentation. Born in Palisades, New York, on August 21, 1989, Hayden Panettiere is an American singer, model, artist, and actress. She is best known for her role as cheerleader Claire Bennet on NBC’s Heroes, which aired between 2006 and 2010, as well as for her role as Juliette Barnes in ABC’s musical drama series, Nashville. Hayden’s acting career began early. Her first appearance was in a commercial for a Playskool toy train at the age of just eleven months. She played the part of Sarah Roberts on One Life to Live between 1994 and 1997, and she had the role of Lizzie Spaulding on Guiding Light from 1996 to 2000. At age ten, she played Sheryl Yoast in Disney’s Remember the Titans. Some of Panettiere’s other notable roles include her portrayal of Kirby Reed in Scream 4 and Amanda Knox in the true crime drama Amanda Knox: Murder on Trial in Italy. She has been nominated for a number of awards including the 2014 People’s Choice Award for Favorite Dramatic TV Actress and the 2013 Teen Choice Award for Choice TV Actress: Drama. She has received a number of awards including the Genesis Awards Top Honor and the Vail Film Festival Rising Star Award. Did you know that Hayden Panettiere is an official supporter of Ronald McDonald House Charities? She is a member of the organization’s celebrity board, called Friends of RMHC. She is also active in the ongoing battle to stop commercial whaling. Part of a confrontation between a team of surfers that included Panettiere and five other activists and Japanese fishermen killing dolphins can be seen in the award-winning Sundance Film Festival documentary, The Cove. Hayden actively works to defend cetaceans, working with The Whaleman Foundation to raise awareness. Petite Hayden and six-foot-six Ukrainian boxer Wladimir Klitschko first began dating one another way back in 2009. Their first relationship with one another lasted two years, and was followed by a two-year split that culminated in the couple reuniting in the spring of 2013. What Our Experts Have to Say about Hayden Panettiere’s Engagement Ring. Hayden Panettiere’s Montblanc engagement ring is unique: in fact, she designed it herself. The ring’s emerald-cut diamond is a huge one, coming in at six carats. It is supported by a split shank setting and is worth an estimated $500,000. Although the ring is smaller than some of the other celebrity engagement rings we’ve looked at recently, a larger stone would look awkward on Hayden’s petite hand. While a celebrity engagement ring with a massive center stone carries a high price tag, a custom engagement ring can be surprisingly affordable when you work with Brilliance. Using our interactive online design tools, you can collaborate with our diamond experts to create a custom ring of your own. Suit your style as well as your budget by working with Brilliance. We bring sparkle into your love and life without high Hollywood price tags.